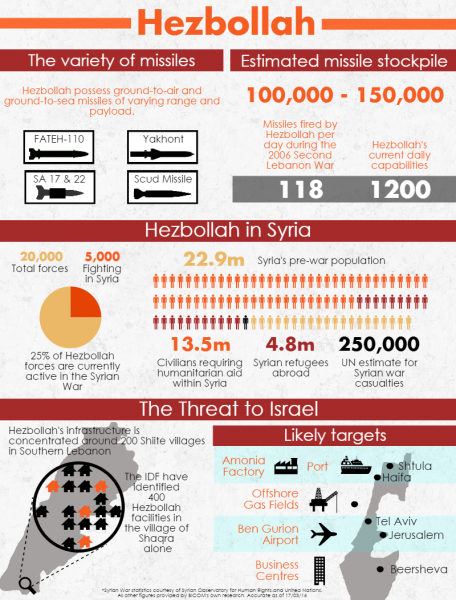 BICOM has released new research that shows how Hezbollah, proscribed by various international organisations as a terrorist group, is using the Syrian conflict to help prepare for a war with Israel. Hezbollah in 2016: damaged goods or dangerous war machine? details how the armed, radical Lebanese group possess between 100,000 and 150,000 missiles, many of which are hidden amongst the civilian population of South Lebanon. The radical group acts as a proxy for Iran, and entered the Syrian civil war with the aim of maintaining Bashar Al Assad’s regime, as well as creating a “state within a state in Syria” as an insurance policy to protect Iranian interests in case the regime were to fall. Its fighters were also directly involved in combat operations in key battlefields, as well as the siege of Madaya, where a reported 40,000 Syrians have been struggling for food. While Hezbollah is looking to avoid an all-out conflict with Israel, it already has a sophisticated military capability that poses serious policy problems for the country it describes as a “cancerous Zionist enemy”. It has threatened to strike cities and key strategic sites throughout Israel, including an ammonia factory in Haifa offshore gas fields, and Ben Gurion Airport. Hezbollah is an armed, radical, Lebanese Shia group which is used by Iran as military leverage against Israel and whose political representatives and allies dominate the current Lebanese government. In March 2016, the six-member Gulf Cooperation Council (GCC) formally categorised Hezbollah as a terrorist organisation, describing it as a “militia” and arguing that “Hezbollah’s incitement and terrorist acts in Syria, Yemen and Iraq are contrary to morality and human values.” Hezbollah’s military wing was designated as a terrorist group by the European Union in 2013. Hezbollah decision to become heavily involved in the Syrian civil war alongside the Assad regime has further polarised an already fractured domestic political arena in Lebanon and generated retaliatory attacks against Hezbollah from within the country. The civil war has also altered its strategy against Israel with the group currently seeking to avoid an all-out military confrontation. However, the organisation continues to attempt to improve its military capacity for a future conflict with what it describes as a cancerous Zionist enemy.